In the previous blog post we talked about the importance of pump impeller clearances -- where having the “just right” clearance significantly influences the efficiency of the pump. In this "Part 2" post, we will dive into how Lovejoy has developed and optimized their coupling designs to address the needs of the industry. The use of this coupling helps eliminate the care that must be taken when attaching piping to the discharge of vertically mounted pumps to avoid piping stress (axial or radial force) on the discharge port. Such force will push the pump out of vertical alignment, causing premature failure. No piping stress can be allowed against the discharge connection. The coupling’s rigid hubs are manufactured with clearance-fit bores and keyways which, allow easy installation on the either motor or pump shafts. Twelve sizes cover bore requirements ranging from 0.44" to 10.5" with square key (or to 276mm with metric key), horsepower-per-100-RPM ratings up to 2,164, and thrust capacities up to 400,000 lbs. 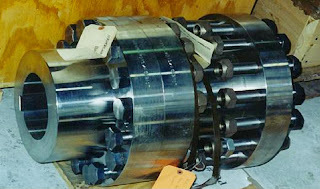 The upper (motor) hub is installed to the motor shaft by axial keyway and hangs on a split thrust ring fitted into the shaft's circular keyway. The lower (pump) hub is installed to the pump shaft by axial keyway, hangs from an adjusting nut turned onto the pump shaft's threaded end. The adjusting nut has a smooth cylindrical shape matching the hubs' outside diameter, with radial holes to allow turning with a spanner wrench. After adjustment is set, hubs and adjusting nut are locked together with axial through-bolts. The Type IV spacer engages the lower hub's through-bolts on one end and bolt separately to the upper hub on the other end. With the ease of installation and removal of the coupling the mechanical seals, which have an 85% or higher failure rate, can be serviced and corrected, helping avoid unnecessary down time and excessive operating expense. Seals should run until the sacrificial carbon face is worn away, but in more than 85% of the cases the seal fails before this happens. Operators should know where the best efficiency point (B.E.P.) is on a particular pump, and how far it is safe to operate off the B.E.P. with a mechanical seal installed. Washing down the pump area with a water hose would cause premature bearing failure when the water penetrates the bearing case. The pumped product will affect the life of the mechanical seal and environmental controls are necessary. If you are not using cartridge seals, adjusting the open impeller for efficiency will shorten the seal life. In most cases the seal will open as the impeller is being adjusted to the volute. In addition, cycling pumps for test will often cause a mechanical seal failure unless an environmental control has been installed to prevent the failure. 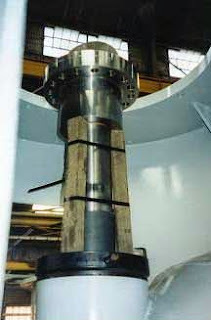 Mechanical seals should be positioned after the impeller has been adjusted for thermal growth. This is important on any pump that is operated above 200°F (100°C) or you will experience premature seal failure. Some elastomeric seals will be affected by steaming the system. A great deal of caution must be exercised if a flushing fluid such as caustic is going to be circulated through the lines or used to clean a tank. Both the elastomer and some seal faces (reaction bonded silicon carbide is a good example) can be damaged. If the elastomer is attacked, the failure usually occurs within one week of the cleaning procedure. The stuffing box must be vented on all vertical centrifugal pumps or otherwise air will be trapped at the seal faces that can cause premature failure of many seal designs. That is why the right seal design and ease of maintenance of the coupling can make such a huge difference in the efficiency of an operation like a wastewater treatment plant. The RA/RAHS Series offers both close-coupled, Type II, and spacer styles, Type IV, in standard (RA) type and high-speed (RAHS) type, which is specially balanced to API 610 tolerances. Either style allows the user to adjust the impeller in order to maintain the appropriate gap between the impeller and housing to maintain the appropriate gap between the impeller and housing to maintain the correct low rate. The spacer styles provide a center section that can be removed to allow the impeller to lift out for maintenance without disturbing and having to re-set its vertical clearance adjustment, or dismounting either the motor or pump housing. All styles and types are available in either steel or stainless steel, for broad applications across water, wastewater, power generation, refinery, and many other industries. Choosing the right coupling is just one step, but a very important one, in the process of keeping America's wastewater treatment plants pumping at peak efficiency. About the Author: Kevin Remack, Vice President of Sales for Lovejoy Inc., has many years of experience in the mechanical power transmission industry and has been a longtime champion of Lovejoy's engineered coupling solutions.